We hope you enjoyed a very merry Christmas! 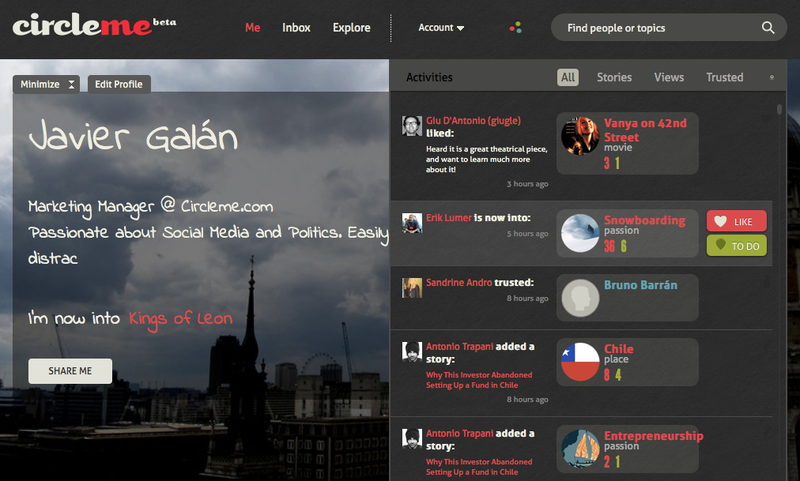 Here at CircleMe we had a great time and we even received a new CircleMe feature from Santa that we are very excited to share with you all: The CircleMe Activity Board. Why an Activity Board? Until now, on Circleme there wasn’t a place where you could find all of your friends’ activities: what your friends are liking, the stories they are sharing on CircleMe… Furthermore, it wasn’t easy to track all the activities about the things that you care about. That wasn’t great, right? We thought so and that is why we developed asked Santa for an Activity Board. Once you click on the button represented as three circles, the CircleMe Activity Board will appear: As you can see, the Activity Board not only keeps you updated about the activities of your trusted friends and things that you care about, but also allows you to easily like or mark as to dos the items that appear in the board. In fact, the Activity Board even allows you to filter the type of information that appears: You can choose to only see Stories, Views or who your friends are Trusting. ← The 8th winner of the Official CircleMe Profile Chart: Carece Slaughter!